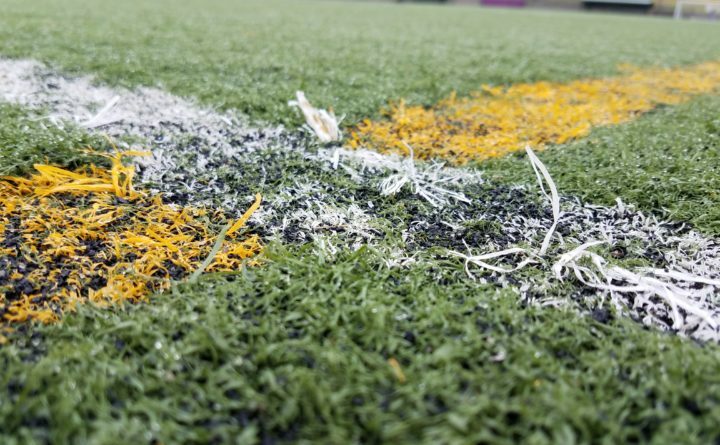 The turf at the Hampden Academy athletic field has outlived its lifespan and started to deteriorate, Regional School Unit 22 officials said. Voters in four towns will decide next month whether to use public money to upgrade Hampden Academy’s aging athletic facilities. District officials in Regional School Unit 22 want voters to approve a $850,000 bond to replace the 14-year-old artificial turf on its athletic field and upgrade the stadium lighting. The vote will take place on Feb. 6. The lifespan of a turf field like the one used by soccer, field hockey, softball and football teams at Hampden Academy is eight to 10 years before it starts to visibly break down, RSU 22 Superintendent of Schools Richard Lyons said. Installing a new field will not only be safer for athletes, it will allow the district to host more games, bringing in more revenue, he said. “We’re starting to see wear and degradation,” Assistant Superintendent Regan Nickels added. RSU 22, which includes the towns of Hampden, Winterport, Newburgh and Frankfort, is one of the only school districts in central Maine with a turf athletic field, Lyons said. The field is used for up to 90 athletic events from April to November, and the district regularly hosts state and regional events on the field. Nickels said the bonded $850,000, plus an additional $110,000 in district reserve funds would be more than enough to complete both upgrades, though an exact project cost has not yet been determined. A public hearing is scheduled for 7 p.m. Wednesday, Jan. 17, in the Hampden Academy Performing Arts Center. If voters approve the financing, the project will likely be finished in August. Polls will be open from 8 a.m. to 8 p.m. at the Hampden Municipal Building, at 106 Western Ave.; the Winterport Town Office, at 44 Main St.; the Newburgh Town Office, at 2220 Western Ave.; and the Frankfort Town Office, at 48A Maine Rd. South. Correction: This story has been corrected to list all of the polling locations in RSU 22 for the Feb. 6 referendum.